Do Dogs And Cats Really Hate Each Other? It's the myth that's been passed down through the ages, the theory that has fueled countless cartoons and movies. Dogs and cats are mortal enemies, and will always hate each other. But is there any truth to the myth? Do dogs and cats actually hate each other? The answer is no, cats and dogs don't actually hate each other. When cats and dogs take issue with each other, it has much more to do with predatory instincts and communication issues. When dogs were first domesticated, many were bred to chase and hunt small, furry animals, according to Dr. Jill Sackman, a clinician in behavioral medicine for BluePearl Veterinary Partners. When a dog sees a cat darting away from him, his first instinct is going to be to chase her, which is of course going to cause the cat to be terrified of the dog. "Little furry things that move quickly are very interesting to a lot of dogs," Sackman told The Dodo. "That is intrinsically part of their biology and drive. That said, I think most dogs that are raised in a home with a cat learn to habituate with a cat and get along very well." When a dog grows up in the same home as a cat, or other small animals, he gets used to the cat and doesn't see her as prey. 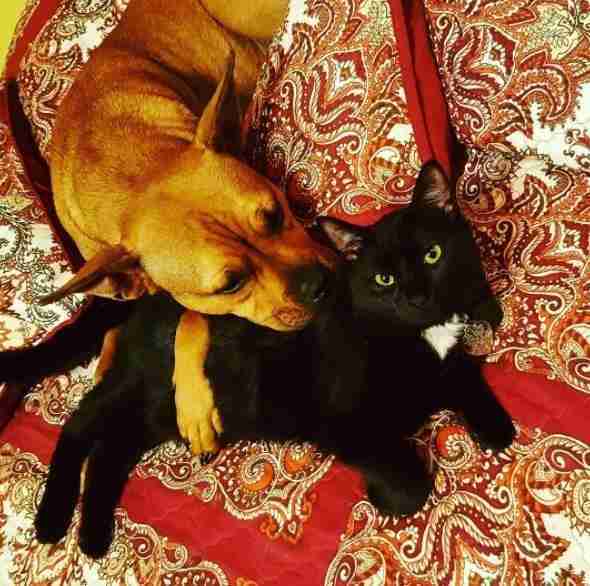 Many dogs and cats who grow up in the same family even form incredible bonds, like Sackman's own cat and French bulldogs, who love to snuggle together. "They will get along with a cat in the house because they've been raised together," Sackman said. "It's not a predatory situation." Another reason that dogs and cats might not always get along is because they're very different animals, and thus have very different ways of interacting with each other. Dogs greet each other by sniffing each other's butts, and that's perfectly normal for them. If a dog tries to greet a cat this way, though, the cat might find it threatening because it's not a typical cat behavior. "They do not instinctively hate each other," Sackman said. "I think this has more to do with cross-species communication to a large degree." So if you decide to add a cat to your family and you already have a dog, or vice versa, don't worry about them instantly hating each other - they just need to get used to each other. After all, communication and understanding are the keys to any good relationship, even between cats and dogs.